Recently Statistics NZ released the Household Use of ICT stats package for the 2012 year, a comprehensive report on the online and ICT usage of kiwi households and individuals. These statistics paints some very interesting pictures in terms of consumer trends, and provides very strong evidence for businesses who still don't think they need to invest heavily in their online presence. IITP was at the launch and this week we take a brief look at some of the more interesting statistics. Kiwis are putting their money where their mouse is. 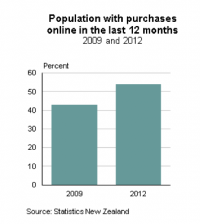 Online purchases are on the rise, with 1.8 million New Zealanders making an online purchase in the 12 months before the survey. Over 70 percent of New Zealanders aged 25-34 years opted for this convenience, though the biggest increase was for those aged 35-44 years - a jump of 14 percent to a total of 68 percent. It also seems that what we're buying is changing. We're not necessarily buying tangible items; over half of those who shopped online had at least one item delivered electronically. This may include items such as e-books, music, or e-tickets. Looking at those who had made a purchase in the four weeks before the survey, women outnumbered men in spending a total value of up to $500, while the more expensive purchases predominantly belonged to men. The number of people spending a total of over $2,000 online has doubled since 2009, to reach 44,000 people in a four-week period. You can download the full report here, or the dataset here.